Cold Air Currents: Has the Kyoto protocol made any difference to carbon emissions? Since Kyoto has signed there has also been a more advanced understanding, albeit a largely ignored advanced understanding, that the accord penalized energy exporters, and generally favoured consuming economies over producing economies. 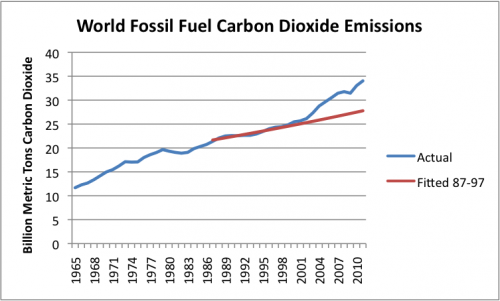 Bjorn Lomborg recently tweeted a graph using data from the Global Carbon Project (and probably the data from Denmark's submission to the UNFCC). The picture, of Denmark's performance, provided in Lomborg's graphic is far different than provided in the graphics presented in the Guardian. Unfortunately, Lomborg's graphic also explains the increased rate of growth in global emissions.